ATTACh is an international coalition of professionals and families dedicated to helping those with attachment difficulties by sharing our knowledge, talents, and resources. Founded by a parent for parents of children adopted from China, or internationally, to educate parents on post-adoption issues related to those who have PTSD or other attachment issues. Parent-led organization supporting families of traumatized children. 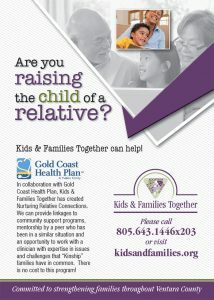 Offers individual and group counseling by licensed counselors and interns to families who request our services. Grief and bereavement counseling is offered to all Ventura County residents regardless of whether the patient was served by Camarillo Hospice. A non-profit organization working to improve the lives of high-risk children through direct service, research, and education. Established in the United States in 1978 and committed to helping bereaved parents, siblings, or grandparents through providing highly personal comfort, hope, and support. A trauma/attachment therapist who trains professionals and parents to work with children who have experienced abuse or neglect. A United States 501(c)(3) charity that supports families touched by adoption from Russia and Eastern Europe. This organization’s purpose is to help develop and improve families’ abilities to successfully adopt and parent their children. A professional association where EMDR practitioners and EMDR researchers seek the highest standards for the clinical use of EMDR. Founded in 1974 by adoptive parents, the NACAC is committed to meeting the needs of waiting children and the families who adopt them. A non-profit institute that trains mental health professionals in the Theraplay® method. Assists children with mental health, behavioral, and emotional disorders by providing services to families such as support, education, and resources.